Usually every PC has a lot of various files – documents, movies, system and audio files, and every music lover knows how hard it is to keep your music collection nice and tidy. The more songs you have, the more difficult it is to remember which folder you saved it to. Sometimes in a hurry we just save all files to the default “Downloads” folder, sometimes we try to be organized and create folders like “Jazz from 40’s” or “Favorite Pink Floyd songs” – only to forget about it some days later. You can find all your audio files using mp3Tag Pro. It’s quick and easy, so let’s see how to do it. Download mp3Tag Pro and double-click the setup program file. Follow on screen instructions to install the program. 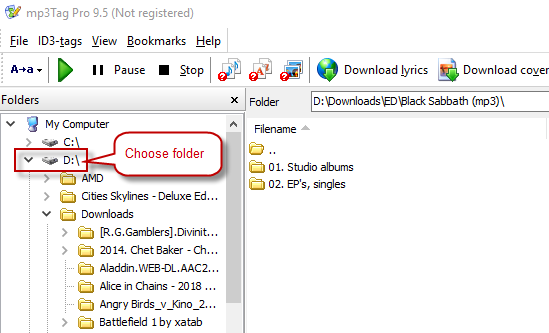 After installation, double-click the mp3Tag Pro icon on the Desktop or find it in the designated folder or the list of installed programs by clicking "Windows" (in Windows 10) or "Start Menu" button (in previous versions of Windows). If you use the trial version of the program, the pop-up window will appear. In that case, just click the "Launch trial" button. Step 3: Find all your songs! The whole process will take no more than several minutes, so just wait a little. And voila! You have the full list of all the audio files stored on your PC – with their location, size and other useful info included. Now you can organize and enrich your music collection further. With the help of the mp3TagPro software you can not only find all your songs, but also sort or rename them, add lyrics or album art to them, play them via built-in player and much much more.